In many cases it is possible to restore a complete Windows backup over the top of the running system, however in some cases this may not be possible, for example, the current PC may no longer boot, or the backup you are restoring is from a previous service pack or contains changes to core Windows operating system software. 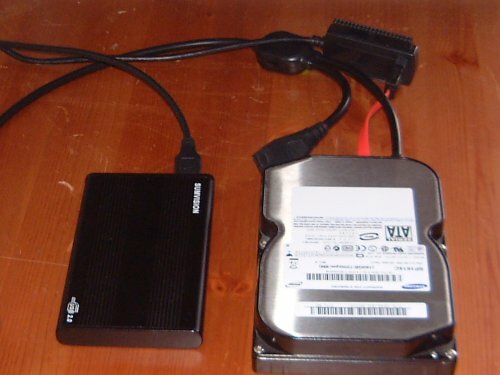 In order to restore any backup there is a requirement to have an operating system with which to perform the restore, whether this be a restore to the current PC, using bootable media such as the AISBackup Restore CD, or in this case using another computer. The only requirement is that the second computer should be running at least Windows version 2000, from which you can restore a backup of Windows 2000, XP, Vista, Server 2003, Server 2008 including both 32-bit and 64-bit versions. The process involves hooking up the disk from the PC you wish to restore and the backup media to a second computer. Two examples are shown and indeed it should be possible using a long enough USB to SATA/IDE cable to link up the disk you wish to restore to without removing it from the PC. In the examples the disk has been removed. In this example we are restoring Windows Vista 64-bit using a PC running Windows XP 32-bit. The backup is on a USB external drive. 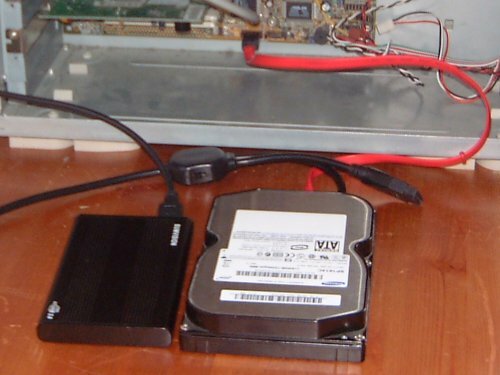 The first stage is to attach the disk you are restoring to; the first example shows the disk connected directly to the SATA port on the PC been used to make the restore.